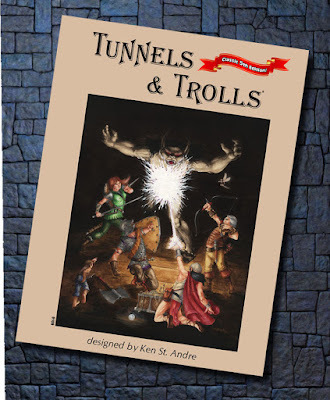 Due to an increased interest in Tunnels & Trolls in general, and, according to Flying Buffalo CEO Rick Loomis, a bit of pestering by fans, based partly on the Save Versus All Wands current series of review posts, 5th edition Tunnels & Trolls is being made available in PDF form (for the first time) on RPGNow for $6.95. That's the same price it was offered at in 1979, and is only 11 cents in inflation adjusted terms. Okay, not quite, but you get the idea. In addition, many other T&T products are currently available on RPGNow, including scans of vintage adventures, revised versions of vintage adventures, contemporary products designed for edition 7.5 or the current Deluxe edition and a number of T&T periodicals and zines. There are many offerings by Flying Buffalo, as well as a large selection of third-party efforts. My only regret is that I couldn't find the unique Judges Guild T&T adventure Rat on a Stick. I've made a list of the vintage items in chronological order. For a full list of all products, go to the Flying Buffalo page on RPGNow. Or search for the Tunnels & Trolls game system to also see the third-party offerings. You can now own the full contemporary version of Tunnels & Trolls, three classic T&T editions and roughly half of the original published T&T adventures and accessories for less than the price of the three 5th edition Dungeons & Dragons core books. No game store in your youth ever carried such a collection, and if one had, you would never have been able to afford it. The Golden Age is now. Well, a random sample of them just worked for me. Do you have a specific example? WOW - thanks for posting the links to the old school stuff! We certainly appreciate it and I'm sure the fans looking for such things do as well!